The two West Hall residents who died in the same week last month both committed suicide, the D.C. Chief Medical Examiner’s office confirmed Monday. Senior Lynley Redwood and freshman Benjamin Asma were both found in their rooms on the Mount Vernon Campus on April 1. The medical reports – made public for the first time Monday – confirm that three students have committed suicide in the same residence hall this semester. Last month, the University announced that it would add permanent counseling services to the 700-student campus this fall. Counselors will be stationed there through the end of this semester. University Police Department officers found 21-year-old Redwood unresponsive in her fourth-floor room on April 1 at about 7:30 a.m. Redwood, whose family lives in Lutherville, Md., was a chemistry major in the Columbian College of Arts and Sciences. During a memorial service for both students, Redwood’s friends described her as a talented student and gifted dancer. As an undergraduate, she worked for a biology lab at the University of Maryland-Baltimore County and was a member of the health care advocacy organization Health Leads D.C.
Benjamin Asma was a biomedical engineering student and member of the University Honors Program. 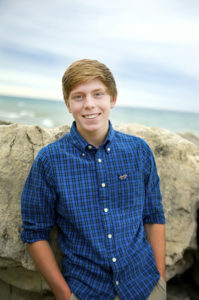 The 19-year-old was a biomedical engineering student from Lake Bluff, Ill. and a member of the University Honors Program, Beta Theta Pi fraternity and club swimming. Asma’s mother, standing by her husband and daughter at the April service, told students to be kind to each other and stay in touch with their families. “Be strong for each other, and please, when you have a feeling that someone might be in distress, please reach out, even if it means calling their parents and they never speak to you again after that, it’s worth it,” Leann Asma said then. The death of another freshman, Sean Keefer, was ruled a suicide after he was found unconscious in his West Hall room on Jan. 21. He was a Clark Engineering scholar and a member of the University Honors Program. Due to an editing error, The Hatchet incorrectly spelled the Asma family’s name in a media credit. We regret this error.